Immigrants travel to the Houston area from around the world for many different reasons and under many different circumstances. These individuals come to Harris County, TX, seeking economic opportunities provided by the industries that thrive in the greater Houston area. In many cases, these individuals might be seeking to reunite with family. Others may be fleeing from violence in their home country. Regardless of the reason, anyone seeking to come to the United States from another country must navigate through the U.S. immigration system. The system can be complicated. A skilled immigration attorney in Houston, TX, can help you navigate the system to fight for the best possible result in your case. 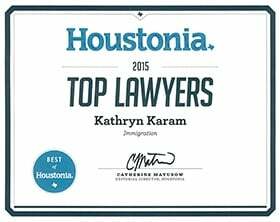 Kathryn Karam is an experienced Houston immigration lawyer who takes on the tough challenges those dealing with the immigration system sometimes face. She has a broad range of experience, and is board-certified in Immigration and Nationality Law by the TBLS (Texas Board of Legal Specialization). Whatever your immigration issue, you can call Karam Immigration Law at (832) 582-0620 to set up a consultation. Karam Immigration Law assists people throughout the Houston area, including in the Energy Corridor, Westchase, Sugar Land, Cinco Ranch, The Woodlands and Clear Lake, TX. Issues in the immigration system can occur for a variety of reasons. No matter your issue, Kathryn Karam can assist you. Permanent Residence / Naturalization: A person coming to Houston to live permanently or indefinitely must obtain a green card, making them a permanent resident. Once a lawful permanent resident, a person may seek to become a citizen. Entering the Country: To cross through a port of entry, you must be ready to deal with stringent security measures. Kathryn Karam can assist you if you run into problems. Removal / Deportation: Removal means being sent back to your home country. You can fight removal, and Kathryn Karam can represent you. Whatever your problem, Kathryn Karam, a immigration attorney in Houston, TX, will fight for the best result in your case. Call (832) 582-0620 today to set up a consultation.